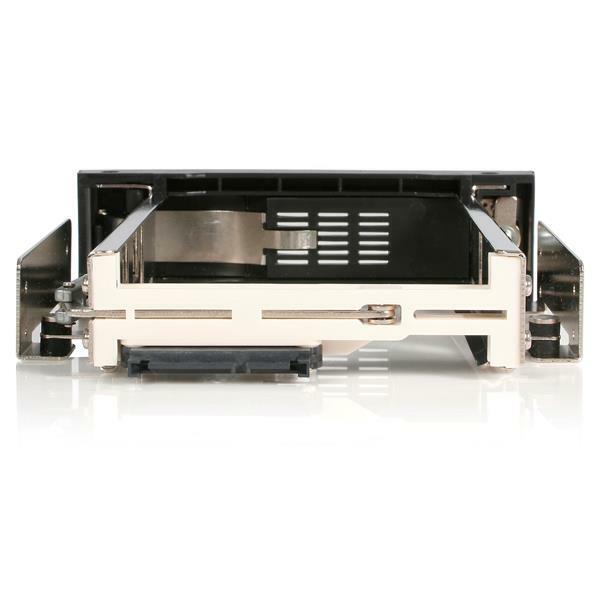 This 3.5in SATA hard drive hot-swap bay allows you to install a 3.5in SATA drive in an available/unused 5.25in drive bay. 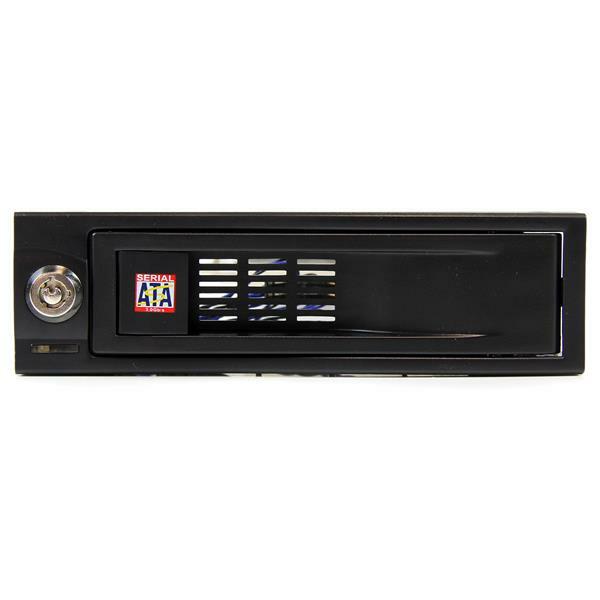 To remove the drive, it's as simple as opening the front panel door; to re-insert a drive, simply insert the drive (connector first) until the door closes. 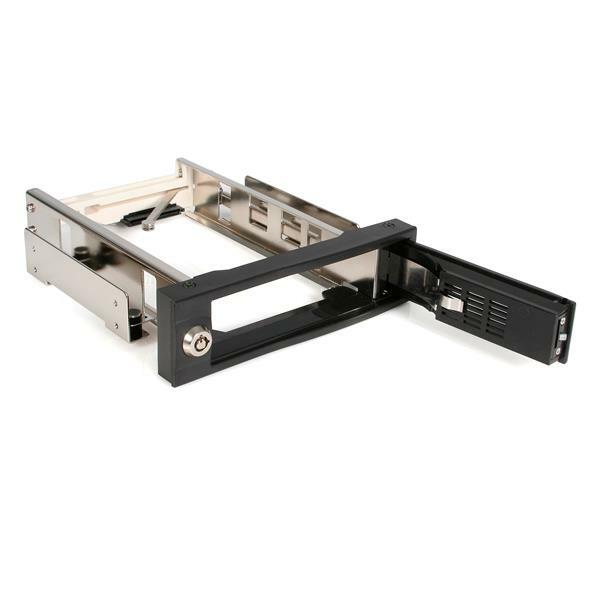 The hot swap bay offers a trayless design that makes it the ideal solution for quick and easy drive removals and insertions as part of a system building process, or integration into rackmount systems or industrial environments. To maximize performance and utilize the full speed potential of your SATA III hard drives, this HDD Backplane supports SATA III for transfer speeds up to 6 Gbps when paired with a compatible controller. Also a perfect addition for operating system image deployment and any task that requires being able to quickly access large volumes of data on the fly, the hot swap bay provides everything you need to expedite important projects while maintaining a reliable storage solution. With support for SATA HDD speeds up to 6.0 Gbps, the mobile rack/backplane is fully compatible with RAID installations to ensure maximum performance and versatility for enhanced storage applications. Designed to provide a durable and reliable operating experience, the mobile rack features a 50,000+ insertion rating and is backed by StarTech.com's 2-year warranty. Everything is hooked up, but nothing is working. What do I do? Use the cables, hard drives, and hard drive rack in another setup to see if the problem is with the components or the setup. Use a different cable, hard drive, and hard drive rack in your setup to see if the problem persists. Ideally, you should test a component that you know works in another setup. To check Disk Management, press the Windows key + R, type diskmgmt.msc, and press Enter. Check to see if your hard drive is listed. If the hard drive is listed with unallocated space, it needs to be formatted. Right-click unallocated and click New Simple Volume. Follow the on-screen instructions to complete the reformatting. Note: Formatting a hard drive erases all of the data on it. Make sure that you back up all of your data before you reformat the hard drive. If the hard drive is listed as healthy but does not have a drive letter assigned to it, for example, C:, right-click healthy and click Change Drive Letter and Paths. Click Add, assign a drive letter, and click OK. Note: A formatted hard drive will not show up in Computer or My Computer until it has a drive letter assigned to it. Can I hot-swap SATA drives with this mobile rack? 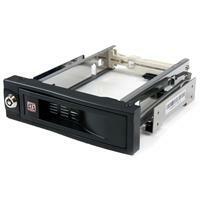 Yes, this mobile rack does support hot-swapping of SATA drives. To use this feature, it is required that the SATA port is set to Advanced Host Controller Interface (AHCI) mode and hot-swapping is enabled. On most motherboards, this is performed within the Basic Input/Output System (BIOS) or the Unified Extensible Firmware Interface (UEFI). If you are using a SATA controller card, consult the motherboard manufacturer's technical documentation for the correct steps to accomplish this.